This paper presents some thoughts regarding the future role of the agricultural processing sector after the demise of the communist regime in Cuba. In the main, the content of this paper builds on a previous USAID study of the agriculture sector in Colombia in the early 1970s conducted by the author (Ricardo 1973) and on the author’s Ph.D. dissertation (Ricardo 1976) written at the University of Maryland. The main objectives of the paper are to examine contributions of the processing sector to the social and economic development of LDCs and to discuss the contribution that the agricultural processing sector could make to the Cuban economy in the future. For purposes of this paper, the agricultural processing sector is defined as the horizontal set of activities engaged exclusively in the production of processed products from the processing of agricultural raw materials. Many economists believe the agricultural processing sector constitutes an important thrust for development in LDCs for the different accomplishments that it can bring about, such as: (1) increasing GDP through the provision of additional goods and new processed products in the country; (2) providing income and employment in rural areas, because of their strong backward linkage to primary agriculture, thus reducing uneven income distribution and diminishing ongoing rural-urban migration problems; (3) creating a source of exports and foreign exchange; (4) providing training to unskilled new employees, as well as fringe benefits, thus upgrading the level of education and living standards prevailing in underdeveloped areas; and (5) stimulating agricultural production by creating new stable intermediate markets for raw agricultural products and assisting producers in improving their farming now-how in some processing activities through vertical integration and production contracts with processors. A very important characteristic of processing industries is its strong relationship with other important sectors of the economy, like the grocery and wholesale sectors, that create thousand of jobs, as well as with the service sector and the growing tourist industry, that bring about a vigorous expanding demand for food processed products. Agricultural processing industries providing relatively sizable amount of employment in Colombia in 1968 were bakeries, beer and soft drink manufacturers, textiles, and the coffee industry (coffee hullers and roasters). There are numerous factors limiting agricultural processing and major problems in expanding processing production in LDCs. The factors below were identified in an industrial survey conducted in 1972 of 200 firms representative of the principal industrial sectors in Colombia. Comments on the survey are limited to the information collected specifically on industries related to the processing sector. The question asked in the survey was to state, in order of importance, the causes and problems that impeded industrial expansion in the previous year. Because of the strong functional interaction (backward linkages) between processing industries and the primary production sub-sector, agricultural raw material availability is a critical constraint. In many industries, difficulties in raw material procurement sets a limit to the size of processing plants, and often explains why existing plants are not being used to full capacity. In the case of canning or freezing fruit and vegetables, a year-round regular supply of the raw material is required for plants to work at full capacity. Even with reduced-scale plants, suppliers—but especially small farmers—in LDCs have difficulties in supplying processors with the required quantities and qualities of the raw material. Fruits are sometimes either too green or too ripe, or too small or too big. Thus, grading and handling in most LDCs increases the processing costs. This stems in part from the lack of government grades and standards and from the seasonal characteristics of the production of some agricultural raw materials. Per unit production costs may be higher if processing plants are small and therefore do not capture the advantage of economies of scale inherent in modern food processing technology. Likewise, costs are higher if plants are not utilized to full capacity. Modern equipment can be imported, but because of the red tape involved in many LDCs, it takes time and much persistence. The quality of locally produced capital goods, which are protected by high tariffs and other import restrictions, is often inadequate to meet investors’ requirements. In most LDCs, transportation costs are high due to poor communications systems and scarcity of modern transport modes, such as refrigerated vehicles needed to move perishable agricultural commodities. In Colombia, for instance, processors relied exclusively on trucks, but only 6% of the highways were paved at that time. Two main truck lines run the length of Colombia’s two major rivers and over the intervening mountain range. Seasonal weather severity, like the start of the rainy season, can disrupt the normal transportation of the raw material (this would also be the case for the sugarcane harvest in Cuba). In Colombia, as well as in many LDCs, high prices relative to total processing costs are charged for various domestic and imported inputs. For example: (1) tin plate had a tariff of 25%, plus 7% for direct taxes, freight, etc. ; (2) some imported packing materials can become very dear due to the variation in exchange rates; and (3) the cost of containers for some of the cheapest processed products represents up to 60 percent of the cost of the final product. There is an abundance of unskilled labor in Colombia like in all LDCs, but a rather severe shortage of skilled, technical, and managerial personnel. New firms have to train most of their workers. Processors, however, reported that labor is readily trained. They also were generally pleased with workers trained in government-sponsored training schools. Fringe benefits provided to Colombian workers ranged from 40 to 60 percent of the basic wage. Credit was very tight in Colombia, as it is in most LDCs. Banks were charging 12% per annum in 1967, with 3 years considered an exceptional long term for a loan. Banks also were limited on the amount they could loan to various types of borrowers. At least 35% of their loans by law had to be to industries essential to development, which includes agricultural processing production. Small firms can get short-term financing only at relatively high interest, thus increasing their costs of production. The market for processed food in Colombia, as in most LDCs, was quite limited. This was probably the principal barrier to any potential large investment in food processing in Colombia. Only a small segment of Colombia’s population has sufficient income to buy relatively high-priced processed food. In addition, most people prefer to buy fresh food when it is available, which is most of the year. Most firms either have excess capacity or could expand it fairly rapidly. However, the market would appear to have room mostly for low-cost items that could tap the masses. Shortage of capacity is of serious concern for those processing activities in which production can take place only in an industrial plant per se. This is the case for breweries, oilseeds crushing plants, etc., that require a minimum investment and use modern technology. On the other hand, the slaughter of livestock and poultry, and the making of butter and cheese, can be carried out at the farm level with little investment and know-how. In many LDCs, scarcity of foreign exchange reserves restricts the importation of capital goods, agricultural raw materials, and supplies utilized by agricultural processing industries. Conversely, feedstuff by-products, such as oilseed meal and fishmeal, badly needed for the preparation of mixed feed, are eagerly exported to gain foreign exchange. In Colombia, working capital on average was equivalent to 25% of annual variable costs requirements (3 months) for all purchased inputs, including utilities and contracted work plus labor payments (including fringe benefits). Admittedly, this is a crude estimate of the operating capital actually required by each individual industry. In general, it should be noted that some processing industries require relatively small investment in fixed assets, but working capital requirements are substantially higher than for other processing industries because of the high cost of raw materials, which are usually paid for in cash upon receipt. Storage capacity limits for perishable agricultural commodities can be an important constraint for the expansion of the processing sector. Most industrial grains, oilseeds, coffee, and other commodities, need adequate storage to keep down their moisture content. Other agricultural products, like potatoes, need refrigerated storage until they are sold to final users. Storage facilities are not included in the processing sector, but rather in the marketing and distribution sector. 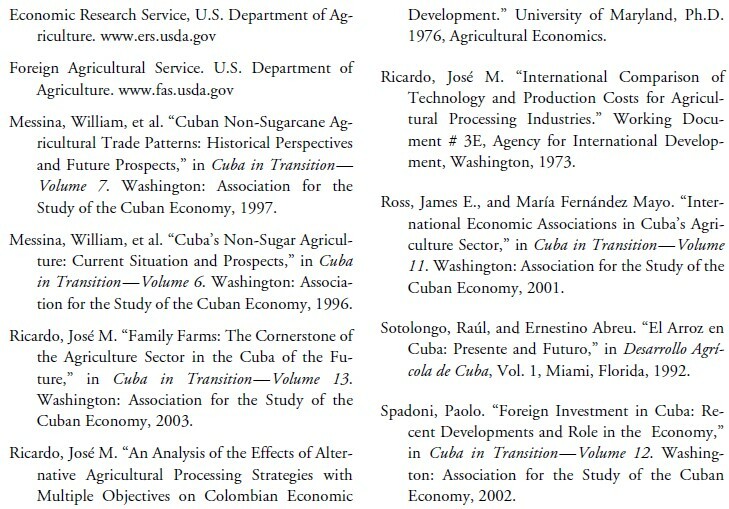 This section summarizes foreign agricultural processing investments (except those made in the sugar industry and related products) in Cuba during the last decade, from work by Spadoni (2002), Ross and Fernández Mayo (2001), Messina (1996 and 1997), and others published in Cuba in Transition. These private investments suggest that there are future opportunities for growth in the agricultural processing sector in Cuba if the appropriate incentives were established for international and domestic private investment to operate. • The Spanish wine distributor Palacio de Arganza signed a joint venture for the construction of a plant in Ceiba del Agua (Havana province) that will make wine for the domestic market. The investment is estimated at $2.5 million. • The Spanish company Alimentaria Peñasanta signed a joint venture for the processing and production of sterilized milk in plastic bottles; the amount of the investment is not specified. • The Chilean company Rio Zaza, specialized in the production of natural juices and dairy products, has announced it will invest up to $3 million to modernize its packaging operation and diversify its product lines. • The Canadian brewing company Cerbuco, which makes beer under several brand names, announced it has extended to 30 years its current joint venture and plans to triple its beer production in Cuba. It also intends to build a new brewery and expand the capacity of its brewery located in Holguin. • The Spanish company Pescanova announced it had extended its commitments for the commercialization of lobsters and that it will invest around $30 million in six shrimp farms in Cuba. Exports of fish and shellfish have become the third most important agricultural export items, after sugar and tobacco products. • An Israeli corporation, BM Group, is providing foreign capital and technical assistant for the production and processing of citrus in the Jagüey area, about 140 km. East of Havana. Reportedly, a $22 million contract was signed in 1991 to improve the quality of citrus being produced on 95,712 acres and for the operation of packinghouses and processing plants. All the marketing of fresh and processed products is directly handled by “BM Group.” More recently, this company entered into another contract for financing, giving technical assistance and marketing grapefruit from about 27,170 acres on the Isle of Youth. Similar economic associations were established with a British and a Greek companies for marketing 76,570 acres of oranges, grapefruits, and limes in Ciego de Avila. There are two more international associations for the production of fresh and processed citrus fruits: a Chilean company operates a juice plant facility at Jagüey Grande and an Italian firm built, at a cost of $8 million, a processing plant in Pinar del Rio to produce essential oils and juice concentrate. • A Brazilian subsidiary of the British American Tobacco company invested $10 million to produce and market cigarettes. They produce six brands, four of strong (dark) and two of mild cigarettes (blond), for the domestic and export markets. • Several other international economic associations have been established in the tobacco industry with investors from France, Spain, and Turkey. They are producing cigarettes and small cigars weighing 3 grams or less (puritos) to be marketed internationally. The Turkish joint venture will produce cigars with 100% Cuban tobacco, as well as cigars with 50% Turkish tobacco. • A joint venture with a Chinese company was signed for the production and marketing of rice, and I presume also for processing (hulling and milling), involving 8,028 acres planted in the province of Granma, and 12,350 acres in the province of Pinar del Río. • A joint venture with Canada’s Sherrit International began operating in October 2000 a new $22 million soybean-processing plant located in Santiago de Cuba. Imported soybeans are used to produce meal for animal feeding and cooking oil at an estimated retailed value of $50 million. • In 1992, Ingelco S.A., a Chilean firm, entered into an economic association to produce 30 million liters of citrus juice annually at a processing plant in Jagüey Grande for marketing in the Caribbean region. • It has also been reported that, during the Soviet financing of the modernization and expansion of the Cuban commercial fishing industry, the Soviet Navy provided financial assistance for the expansion of the seafood processing activities and various service-related industries (probably freezing and ice making facilities). We do not know how well these investments have performed, but their presence is a clear indication that even under the restricted economic and administrative conditions prevailing in Cuba, there is interest on the part of foreign investors in participating in the development of the agricultural processing sector in Cuba. It could be expected that this interest would be much greater under conditions of a free market economy. The future outlook for the Cuban sugar industry is not encouraging, with the current world market raw sugar prices around 6.5 cents per pound (mid 2004) and Brazil consolidating its position as the world’s largest producer of sugarcane, sugar, and fuel alcohol, as well as the world’s leading sugar exporter. The cost of producing raw sugar is generally estimated at 5 to 5.5 cents per pound for the Center-South region of Brazil; about half of the sugarcane output is dedicated to the production of fuel alcohol (Foreign Agricultural Service, U.S. Dept. of Agriculture, 2004). Without any reservation, the Cuban sugar industry’s players—sugar mills owners, sugarcane growers, industrial, and agricultural workers, and the leaders of the transition government—must mutually agree to pursue a creative and aggressive policy toward developing new sugar-based products and new international markets. The first effort should consist of expanding the manufacturing of processed products in which sugar is an important ingredient, e.g., candies with tropical flavors, marmalades made of tropical fruits, canned condensed milk, brown and refined sugar prepared in 2 tsp. packets for the hotel industry and for exports to other Caribbean islands, and so on. Second, processing sugarcane directly into the production of molasses for rum or the utilization of bagasse for the manufacture of cardboard or other purposes, and even to consider the possibility to produce “fuel alcohol” with potential partners from Brazil and the United States. Third, develop new markets for raw and refined sugar by improving our commercial and political relationship with other sugar- importing countries. The dismaying outlook for sugar exports is dissipated somewhat by the prosperous and growing tourist industry in the Caribbean region. Cuban policy makers should dedicate abundant resources and personnel for the organization of tourist-oriented training programs to deal with the expected influx of new tourists from the United States and the development of a modern and diversified food processing sector which could constitute the main provider of processed food to the whole Caribbean tourist industry. Baking Industry: The baking industry was the largest provider of employment among all food processing activities in Colombia in 1968. Using the same ratio of bakeries to population as in Colombia, and considering that Colombia’s population was approximately 2.8 times the size as Cuba’s, it can be estimated that Cuba could support an estimated 860 bakeries, which could provide jobs throughout the national territory. Brewery: Beer is the world’s best selling alcoholic beverage. Beer is basically made from malted cereal grains, most often barley, water, hops, and yeast, all of them imported, except for water. I believe small breweries located next to large provincial cities and tourist centers, producing beer with their own distinct flavor and finish, could develop their local and tourist clientele in a short period of time. Tours of these small breweries could make an additional attraction for tourists. Soybean Processing: Soybean oil is a substitute for other more expensive imported oils, like olive and peanut oil; it is also used for margarine, shortening, and salad and cooking oil. It is cheaper to import the soybean seeds and to process them into edible oil than to import the finished processed oil. Furthermore, the utilization of soybean meal as a vegetable protein source in feeds for poultry and livestock (principally for dairy cattle and swine) is a requirement for the full development of these agricultural enterprises. Also, the development of a sound mixed feed industry depends largely upon the availability of soybean meal all year around. Cuba has a relatively new plant in Santiago de Cuba, but additional processing capacity will be needed to meet future demand from the mixed feed industry, and potentially from the expansion of poultry and livestock production. This industry presents an opportunity for organizing farmers, especially small growers, into vertically integrated “true” cooperatives, handling poultry processing plants as well as mixed feed plants to process poultry and producing livestock products. Poultry Processing Plants: Expansion of current poultry dressing plant capacity, and installation of new poultry processing plants, will be required to meet growing national and tourist demand for fresh dressed chickens. Elsewhere I have proposed (Ricardo 2003) that the number of chickens (broilers) produced per year in Cuba should be limited on a per farm basis. This should be done for two reasons: sanitation and disease control, and to secure that small farmers interested in growing broilers have an option to operate a profitable enterprise. Poultry processors in the US are usually integrated with mixed feed manufacturers and broiler growers. The poultry industry is the most industrialized sub-sector of U.S. agriculture, with 95% of growers using production contracts in which growers provide the land, poultry houses, fuel and labor, while the contractors provide the baby chicks, feed, medicines, and veterinarian services. Rice Processing: Rice production and processing in Cuba in 1958 reached the highest modern and technological advances of any other agricultural processing industry in Cuba. Production of milled rice increased from 836,000 100-lbs bags in 1947 to 3,693,000 in 1956, an increase of 442% in 9 years. Cuba had the highest per capita consumption of rice in the Western Hemisphere, at 110 pounds, in 1956. Cuba’s production surpassed 50-55% of total domestic consumption (Sotolongo and Abreu, 1992). We need only to restore the production techniques and managerial experience of the Cuban professionals that supervised the agronomic and industrial advances of the rice industry in Cuba prior to 1959. Coffee Processing: Coffee production has been an important traditional crop in Cuba since the XIX century. Cuban coffee production was gradually increasing, with natural cyclical oscillations, from 561,000 100-lbs bags in the forties to 1,056,000 100-lbs bags in the 1959-1960 crop. Coffee processing capacity has the potential to increase significantly in the future. Processing industries had a prominent participating role in the industrialization of large developed countries like the United States and France, the largest agricultural processing country in the European Community. In LDCs, their role is even decisively more important because of their heavy dependency in agriculture. Most LDC exports are agricultural processed products, at least to some minimum degree of transformation, like sugar, green coffee, milled rice, etc., and a great proportion of LDCs’ population live in rural underdeveloped areas. In general, most of the food we eat or drink everyday is processed. Perishable agricultural products are canned or processed for preservation, or for improving their quality and taste or convenience. The most salient importance of these industries is their contribution to the social and economic development of LDCs. They have multiple roles, such as participating in the growth of manufacturing activities, providing better paid jobs for skilled workers, and providing a steady market for agricultural output from rural areas, thus increasing rural employment opportunities. Furthermore, processing opportunities existing at the farm level might foster rural transformation by eliminating rural poverty and improving livelihood of smallholders, thus slowing down rural migration to urban cities. A survey conducted in Colombia in 1972 by the Association of Industrialists, revealed that the major constrains to the expansion of processing capacities were: (1) lack of raw materials; (2) lack of working capital; (3) lack of domestic demand; and (4) of lesser importance, lack of adequate equipment. The close interrelationship between primary agriculture production and processing is demonstrated by the strong backward linkage index (BLD index) of 50 percent or more, indicating that most of the purchases of the processing sector were of agricultural raw material. Surveys conducted in Thailand revealed that about 95 percent of rice production was processed in domestic commercial rice mills, while a survey in Guatemala showed that 98 percent of households took their corn to commercial mills and carried the corn meal back home to make tortillas. The Colombian 1968 agricultural processing study showed that the percentage of primary agricultural production used by processing industries was nearly 28%, compared with only about 15% when coffee production is excluded. The value added by agricultural processing industries represented nearly 42% of total value added by the manufacturing sector. • Conduct a nation-wide survey of commercial processing industries and farm and small plants operating similar activities, to identify: (1) total and potential capacity; (2) actual and potential factors limiting production; (3) actual and potential raw material supply sources; (4) present and potential tourist and domestic market sizes; (5) credit needed and working capital requirements for actual and full capacity operation; and (6) communication systems and modern transport modes available, e.g. refrigerated vehicles to transport perishable agricultural raw materials, etc. • Provide agricultural credit to stimulate a rapid increase of food production from the small farmers sub-sector. It is recommended that the credit be extended to small and medium size farm operators for the processing of coffee, cacao, tobacco, and other agricultural commodities processed at the farm level. For example, the credit extended to coffee processors could be tagged for improvements of cemented patios for sun-drying of coffee cherries and for increasing the production of washed coffee production. • Start at once studies jointly with major international financial institutions and other organizations and with potential private investors, to identify agricultural processing projects and their agricultural, industrial, marketing, financial, and social and implications. Bona-fide joint ventures with the Cuban State as a regular partner, but with hands off from managing and providing labor, are acceptable. Furthermore, profit sharing or stock purchasing options to interested employees of the jointly-formed companies should be encouraged as an incentive to increase labor productivity and expected profits. • Promote production contracts whereby the farmer, i.e., broilers’ grower, provides the land, poultry houses, fuel, and labor, while the contractor (processor) provides baby chicks, feed, and drugs, and the technical and veterinarian support, in exchange for a pre-determined, mutually agreed price. “Vertical integration” is another arrangement whereby more than one link of the production and marketing chain is brought together under a single management structure. In this case, the same company could own, for example, a hatchery (for the baby chicks), a feed mill, and a poultry processing plant, buying the raw material from farmers or livestock producers. Farmers’ and growers’ marketing cooperatives are sometimes organized into two or more stages of vertical integration. • Promote modernization and make critical needed improvements in municipal slaughterhouses to terminate or minimize the excessive waste “surplus” of by-products such as blood, bones, viscera, and other by-products that could be used as raw materials for other processing industries. • Issue standards for fruits, vegetables, and other farm products to promote quality and national standardization of both fresh and processed products. Prior 1959, official inspections of packing operations of cucumbers, tomatoes, cantaloupes, and other vegetables, were performed in Cuban fields. Certifications issued by inspectors of the Marketing Agricultural Service, U.S. Department of Agriculture (USDA), permitted Cuban packed boxes and cases to be exported directly to their final destination in the United States. Furthermore, mangoes, which were not permitted to enter the U.S. because of the medfly quarantine restriction, were fumigated in Havana and allowed to enter the U.S. without any other further restriction. This relief of marketing and quarantine restrictions was successfully negotiated between USDA (through the office of Agricultural Attaché at the American Embassy in Havana) and the Cuban Association of Exporters of Fruits and Vegetables. • Modernize and expand the fish canning and the fish and shellfish freezing and ice-packing processing facilities. These products can generate direct exports and also supply the tourist industry. • Provide incentives for private investments in the manufacturing of containers, packaging materials, and other ancillary supplies used by agricultural processing industries for the export and domestic markets. The nation-wide survey of the food processing sector recommended above should determine whether adequate quantities and qualities of these supplies will be available and at a reasonable cost. For example, plastic containers are internationally used for mineral water, glass bottles for beer, tin products for canned vegetables, wooden crates for the exportation of fruits, and so on. 1. The author expresses his deep gratitude to Joaquín P. Pujol for reviewing and presenting this paper.